Twenty-six people are dead and 23 are missing following landslides on the island of Biliran in the eastern Philippines, officials said. 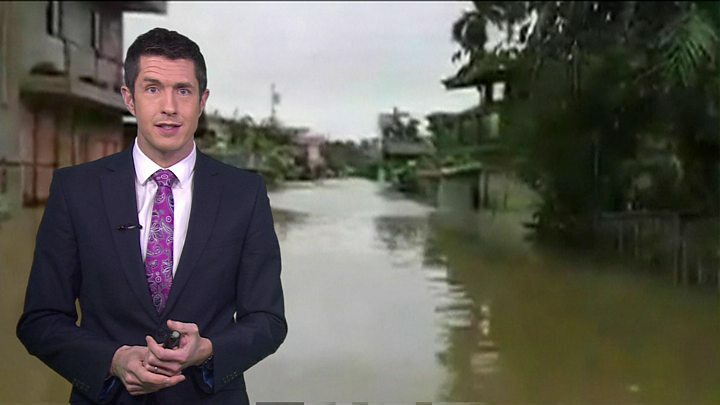 Tropical Storm Kai-tak, known locally as Urduja, battered the area on Saturday with heavy rains, strong winds and flash flooding. One police officer told AFP news agency "rocks as big as cars" had been dislodged by the rainfall. About 88,000 people were forced to leave their homes ahead of the storm. The storm has also disrupted ferry services, disaster officials said, leaving more than 15,000 passengers stranded, many of them trying to reach home for the Christmas holidays. However, the storm weakened on Sunday and was downgraded to a tropical depression. Who cleans up after hurricanes, earthquakes and war? "Rocks as big as cars fell on concrete houses after three days of continuous, heavy rain" in the mountainous district of Lucsoon, chief inspector Lilibeth Morillo told AFP. Sofronio Dacillo, Biliran provincial disaster risk reduction and management officer, told the agency that the 26 victims had been killed in four towns. A rescue operation is under way to locate any trapped survivors. Local reports said the entire province was now without power and much of the area had reduced water supplies. Bridges crossing to the island have been damaged, making it difficult to bring in rescue and repair personnel. The storm tore across the wider region on Saturday, including the neighbouring islands of Samar and Leyte, damaging infrastructure and bringing down electricity lines. The region is still recovering from Typhoon Haiyan, which killed more than 5,000 people and affected millions in 2013.